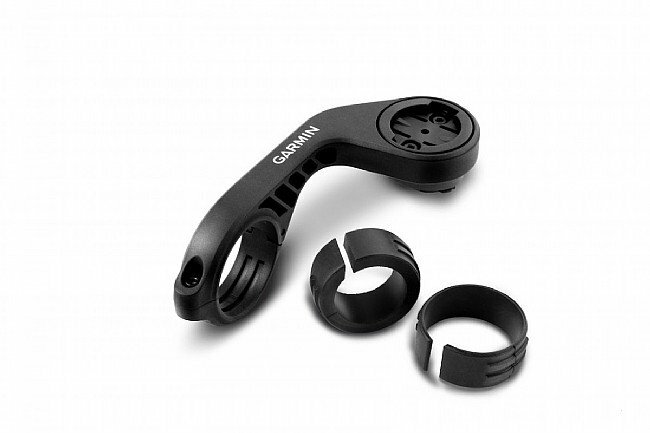 The Garmin Varia Out-Front Dual Handlebar Mount makes it easy to simultaneously attach a Garmin Varia headlight and Edge® computer without cluttering up valuable handlebar space. A quarter-turn mount on both the top and bottom of the extension allows the headlight to be mounted underneath while the Edge® head unit sits on top. The composite construction makes it lightweight and durable, and it installs easily thanks to its hinged construction. Includes 2 shims for compatibility with most handlebar diameters. I have one of these on each of my 3 bikes which allows me to have one Varia light which I can quickly and easily attach to the one that I choose to ride. It makes for a compact arrangement for both light and computer and the light doesn't take up additional space on the handlebars. One drawback would be if there is no round place on the handlebars to attach the mount such as on some of the one-piece aero handlebarstem combinations. Compact method of combining computer & light. This is a good Garmin computer mount that allows quick & easy attachment of a Garmin Varia light underneath the computer. By having these mounts on several bicycles, it allows the use of one light to be available for all of the bikes. The only disadvantage is that lights other than Garmin may not be adaptable. I have two bikes so I needed a extra arm. This are will fit the Garmin edge 1000 just fine.